Before the Wednesday evening premiere of Whitney. “Can I Be Me” at the Tribeca Film Festival, its co-director (and documentary legend) Nick Broomfield announced that his film had been in jeopardy of being yanked from the festival slate—he’d been given final the go-head to screen less than three hours before. Since last year, Broomfield has talked about the pushback he’s experienced from Whitney Houston’s estate, whose current executor is Pat Houston (the wife of Whitney’s half-brother Gary Houston [né Garland]). To Indiewire in May 2016, Broomfield said Houston’s estate had contacted interview subjects and asked them not to participate in his project, which is scheduled to air on Showtime later this year. “It probably says more about them than about my production,” he said. Was it so? Was Whitney bisexual or at least in love with Crawford? The documentary suggests something like that without ever quite nailing it down, and yet you do get a sense of general intimacy and the strain it put on Whitney’s relationship with her husband. Less cinematically graceful than 2015's Amy Winehouse bio-doc Amy, and missing exclusive, current interviews with key voices like Brown’s, Crawford’s, and Clive Davis, Whitney. “Can I Be Me” is nonetheless a treasure trove of Dolezal’s long-unreleased footage (as well as some Being Bobby Brown outtakes). It is a moving encapsulation of all that Whitney had to sacrifice to be a superstar—especially how impossible it was to live up to the pristine image with which she was first marketed (and the ensuing backlash for her early music being considered too white in its sound). If Whitney Houston never existed and someone presented her story in the form of a novel, it would come across as pure fantasy, too extreme in its highs and lows to be believed. Watching it all compressed into just under two hours is, frankly, surreal. I talked to Broomfield, Dolezal, and the movie’s editor and producer Marc Hoeferlin about their movie yesterday. An edited and condensed transcript of our conversation is below. JEZEBEL: Rudi, at what point did you actually start to try and get this footage produced? RUDI DOLEZAL: It’s a variety of footage. The dominant footage in the film is from ‘99, but I actually started working with her right after the first album, ‘cause I was doing television programs in Germany and Austria. Even after the first album I interviewed her. Around ‘99 I did a documentary called Freddie Mercury: The Untold Story, and she said, “Rudi, I want a film like this about me.” Of course, every film like this is different, but she meant a long documentary. I said, “Let’s start tomorrow.” She said, “OK great, Cologne, Hyatt Hotel, 12 o’clock.” That’s where her European tour started. I was there was a crew and it was a journey that ended with the last concert of that tour. This is when the big chunk of the footage, which is now in the film. And then I also did some interviews around 2012 or ‘13 with Burt Bacharach or the mother, etc. There were different waves. Last night, after the premiere you said it was shelved when you asked Whitney to talk on camera about her drug problem. Dolezal: That was one thing and the other thing, just to make it short, it was years and years of negotiations with the estate, which in the end turned out to be completely fruitless because they didn’t keep their word. We were making handshake arrangements and then when it came to contracts there was something different in there. This was a very personal thing to me at the time and its was entirely between Whitney and myself, and I couldn’t stand people who hadn’t even been there talking about what Whitney would have wanted without being in one of the dozens of meetings or days or evenings I had with her. How did you get the sense that she had a drug problem? Was she openly doing drugs when you filmed her, or was she just high? Dolezal: No, I never, ever saw Whitney doing drugs. She never, ever asked me to participate anything, same for Bobby Brown. They never asked me to organize anything. I had never physically seen them being high or on something. I just realized when she was sent home from the Academy Awards [rehearsals in 2000], and the whole world knew, “Oh my god, there’s a problem.” She was always on time, very nice to me and my crew, and she was not a diva, and she was very nice to work with. All the things people said I cannot reproduce because it was not true for my work with her. So you didn’t get the sense that she was high in any of the footage in the movie? Not even when she and Bobby were acting out scenes from What’s Love Got To Do With It as Tina and Ike Turner? Or when Whitney was screaming and pumping her fist while watching Set It Off? Dolezal: No... I don’t think so. Have you ever smoked weed? Rudi: Are we talking about that or are we talking about drugs? She was also drinking coffee and maybe drinking a glass of wine. I’m talking about the problem: cocaine, or smoking cocaine. Never around me, never obvious. It seems like there is some unseen footage from Being Bobby Brown in this movie? NICK BROOMFIELD: One of the producers from Being Bobby Brown gave us a choice of all the outtakes. Most of our film concentrated on an earlier period. I was kind of keen not to spend too much time with Whitney right at the end because she changed so much, but [Tracey Baker-Simmons] had some amazing stuff. It’s fascinating to look at it. The conversation in the restaurant [about] Bobbi-Kristina[’s weight], they obviously forgot they were being filmed and you kind of got a sense of their dynamic. And the stuff in the bedroom—pretty amazing stuff. MARC HOEFERLIN: That show itself comes across as that train wreck of a show. It wasn’t shot like that. It was shot really well and observationally and I don’t know if that was the intention to do that kind of reality TV thing. That footage is really amazing, really long takes and you get a really good idea. Broomfield: After her demise with the Academy Awards and the Diane Sawyer interview, the world’s perception of her changed, as Rudi said. You no longer make the same kind of film as you would have done before that. The whole debate became she’s a drug addict, and I guess it was like: “Are they really sober or are they high again?” I guess it was like having a ball and chain when you’re in a good mood and you’re mucking around, people think you’re high. Certainly she’d just been through rehab for a lot of that show, but who knows? Dolezal: [Whitney’s hair stylist] Ellin LaVar says it once, that before the Academy Awards, Whitney was always funny and making fun on tour and in hotel lobbies, but she said after the Academy Awards, people said, “Oh she must be high.” They wouldn’t have said that about the same behavior months earlier. You mentioned yesterday that just hours before the premiere you got the OK to screen it from your lawyers. Last year, you said that the estate’s pushback “probably says more about them than my production.” Is that still the case? Or does the estate consider the content of this movie dangerous? Broomfield: Rudi knows them very well and has his own history with them. My feeling, which is kind of the most disappointing one, is they don’t care about the content. What they care about is the money. And this is a commercial thing. I might be completely wrong here, but my summation partly from talking with Rudi, is that they want to write Robyn Crawford and Bobby Brown out of Whitney’s life as much as possible. Bobby Brown painted in the corner, standing in the dustbin as a naughty boy. And Robyn, it’s almost like the relationship didn’t happen. I don’t think you could have made the film that we have made with the estate, but I think that they will control their film in that way. I think their prime interest in stopping this film is a commercial one. Dolezal: I’m used to working with estates. I worked closely with the Freddie Mercury estate. I worked closely with the Michael Jackson estate. That’s usually the first address you go [to] because they are representing an artist that is not here anymore. My experience with the Whitney Houston estate is...I don’t find an English word. I’m used to: If we say something and we shake hands, we made the contract. Those people are, as Nick said, driven by something else. Not content, not what Whitney would have wanted, not what’s good for Whitney. And that’s what I’m blaming them [for]. After all, it’s not about Nick Broomfield or Rudi Dolezal or the estate, it’s about Whitney Houston. Who are you dealing with mostly? Pat Houston? Dolezal: It’s different from time to time. In the beginning, it was not the estate. The company was called a different name. It was Donna Houston and then later Pat Houston. Do you believe anything that Leolah Brown [Bobby’s sister] has said about this? That there might be nefarious underpinnings to Pat Houston’s behavior and motivation? Broomfield: I’m anxious to get into all this murky tripey stuff. We very consciously wanted to make a film the redressed the history of Whitney. No one’s pretending she didn’t have a drug problem, but as a reminder as a kind of person she was. I think she was judged so harshly and mocked. In earlier cuts we had a lot of Letterman and Leno jokes in, and other lesser known talk show hosts. They really just wiped the floor with her and everyone laughed. I think it must be devastating to Whitney, who has already got ego problems and must have felt a terrible failure. I think a lot of our motivation was to try to come up with her humanity. That kind of thing. She also had the misfortune of dragging around these lesser human beings who were living off her and managed to get through her money. I don’t think she got through her money, I think they got through her money and are kind of trying to continue to do so. But I think that’s another film, really, or a different subject. Dolezal: My motivation was: Here I was with footage when you hear and see her singing and I was privileged to be the guy who was filming that. It was one of the most outstanding, magic moments I ever filmed in my life with any band. I wanted this to be out in an appropriate project and I think the Whitney Houston onstage is what I’d like to talk about more. Broomfield: In that world, I think there is a culture of violence. And the violence wasn’t just from Bobby Brown. The violence was from Cissy Houston, it was from Whitney, I think they had a tempestuous relationship. And there was Bobby Brown and Robyn and Cissy and, you know. I think there was more fisticuffs in that group than there might be in other places. I have no doubt that there were moments when that happened, but if you talk to people that were close to Whitney, she could knock him out too. But do you really want to get into all that? I don’t really think so. I don’t think Bobby Brown was the villain. He’s been painted this role and I don’t think it’s accurate. Did you attempt to reach out to Robyn Crawford? Broomfield: We didn’t directly. I knew where she was and all the rest of it. The people who were close to her said she’d married somebody, she wanted to move on with her life. 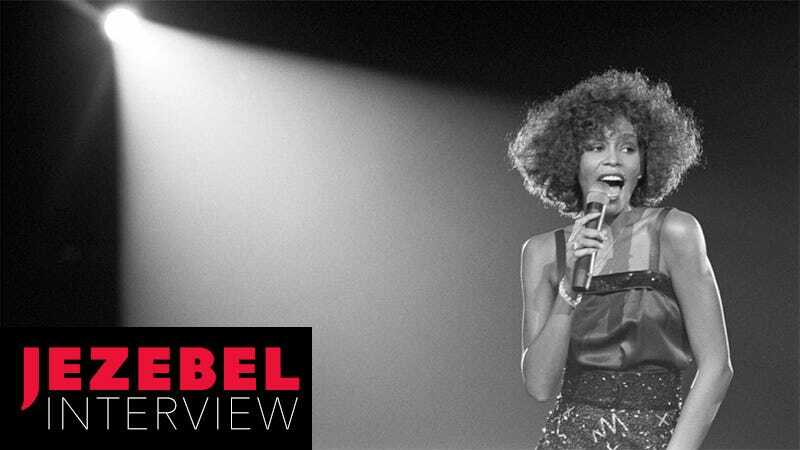 She’d never spoken about Whitney. What we did was we, through a couple of her very close friends, let it be known that we would like to talk to her if she wanted to talk and she basically said, “I want to get on with my life. I don’t want to talk about it.” I think you have to respect that. She’s in a relationship with someone else. I think it’s just a different chapter in her life. I would have pushed it really harder if I thought one needed it. I think you get a real sense of their relationship by the film. I don’t know that you even want to see a present-day Robyn. Maybe her voice would have been interesting, but I felt like you really got the dynamic of the relationship. The same thing when you look at present-day Bobby Brown. He’s obviously very controlled by his new marriage. He comes up with the odd sentence, but he’s moved on with his life too. He’s kind of a different person from what he was then. I think Rudi’s footage and what’s there really capture that dynamic when it was happening.